Instantly at odds, Quentin and Sophie yet find common ground when she is the only one who can reach his troubled son. There's a light within Sophie that Quentin has never known, and a small spark of the hope that left him years ago begins to grow. But when the secrets of Dierenpark can no longer be kept in the past, will tragedy triumph or can their tenuous hope prevail? Elizabeth Camden is a phenomenal storyteller. She has the ability to to bring together so many aspects seamlessly. You can have mystery, history, a bit of suspense, and romance all together, but neither over power each other. But the main thing I love about her stories is her ability to bring to attention smaller back grounds or little known facts of history. In Until the Dawn, it is the start of the Weather Bureau. You hear about how when records were first started, but who started them? Until the Dawn is another fantastic story. I really enjoyed Sophie, she was a smart girl and caring, but I also understand Quentin. They each have backgrounds that aren't fun in this area and they are both trying to work through them. Quentin comes off a bit cold at first, but he is a single father trying to do the best for his son. Sophie is a girl just trying to make a living. And in all honestly, with the way that Quentin and Sophie meet, I was surprised to how calm Quentin was in their meeting with the circumstance. It did give them good grounds to build from. Pieter was a sweet kid to read about, however, the poor kid has had to deal with a lot and then thrust into a creepy introduction to his new home. That is a hard thing to deal with, but it played out well with the story. Pieter and Sophie were great together. The settings for this story were great. They enhanced and pushed the story forward. But really hooked me was the history. 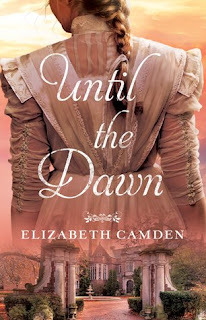 The research that Elizabeth Camden did for this book just shone. It flowed effortlessly and just made the story pop! Elizabeth Camden is the author of eight historical novels and has been honored with a RITA Award, Christy Award, and Daphne du Maurier Award. With a master's in history and a master's in library science, she is a research librarian by day and scribbles away on her next novel by night. She lives with her husband in Florida.